Soho has long had a reputation as the bohemian area of London, sometimes seedy, sometimes artistic. It's certainly long been a magnet to those a little outside mainstream society, which is perhaps why it attracted musicians in the 1950s. Located close to the music business centre of Denmark Street (just off Charing Cross Road), it was an area open to new ideas in music - and that included skiffle and rock when they first arrived. If there was one place that could be said to be the cradle of 1950s music in Britain, it was the 2I's coffee bar on Old Compton Street. That was where everyone wanted to play - and many did. It had opened in Soho originally because of the large foreign population already familiar with espresso (or frothy coffee as many English called it), and the attraction of plenty of young people who would spend time in a coffee bar. The music came as a way to bring in even more young people, and proved far more successful than owner Paul Lincoln could ever have imagined. 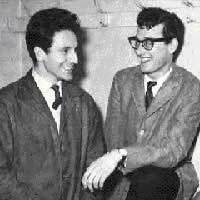 It began with skiffle in the mid 1950s - even the great Lonnie Donegan, already a star, played there, and he was followed by many other hopefuls. There was a house band, the Vipers, and aspiring performers could sit in and prove themselves. Those who did well were booked, and could expect to receive a little under a pound (plus a meal) for four hours' work. Quite how it achieved its reputation is, perhaps, a bit of a mystery. But hopefuls flocked there, and many were "discovered" as budding agents, TV producers and impresarios came to view the talent. Tommy Steele, Cliff Richard, Adam Faith and many, many others made their start there, and as the skiffle boom faded, to be replaced by rock'n'roll, the 2I's embraced that, too. The place became as famous as the people who played there, especially after it was featured in a remote broadcast of the seminal music TV show, 6.5 Special. Eventually a mythology grew up around it, one that in many ways was justified. The policy of giving anyone a chance, and finding other work for musicians (even if it was only sweeping floors in the place) made it a welcoming home for those who wanted to make their mark in music. Although it was over an espresso bar, the Condor Club was in a different social league to the 2I's. It attracted the rich and titled who wanted to slum it a little in Soho. Although it exposed the hopeful singers to an audience that had more power, the pay was comparable to the coffee bars (pasta and a pound). It didn't make stars the way the 2I's did (indeed, the only one to be discovered there was Marty Wilde), but it offered somewhere different to play, for those eager to show their talent. In the wake of the success of the 2I's, coffee bars sprang up all over Soho (the first had been the Mocha Bar in 1953, reputedly owned by film star Gina Lollabrigida) to cater to youngsters and foster young rocking talent. The vast majority didn't survive long, and even those that lasted a few years mostly just achieved anonymity.